The first 500 metres was a good race between SA, Tasmania and Victoria with Victoria taking the honors narrowly through this part of the race. This continued through the second 500 metres with SA then taking the lead and never reliquising it throughout the rest of the race. A spirited challenge by Tasmania in the last 500 metres could not break the South Australians who won by 1.8 seconds. 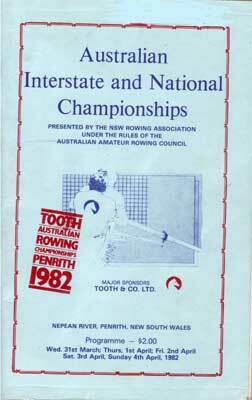 After many years as the top Australian sculler, Ted Hale finally surcumbed to Andrew Cassidy of Victoria in a close race. Cassidy led from the start and despite a huge effort by Ted Hale in the final stages of the race, Cassidy held on to win narrowly. Tasmania led all the way and despite a great effort by Victoria late in the race, they went on to win comfortably. A race developed early between NSW and VIC with NSW taking the honours despite a desperate push to the line by VIC. The wining margin was 0.8 seconds. Victoria and SA led early but by the halfway mark, Victoira had gained the lead. They then consolidated this lead and went on to win by 6.2 seconds to NSW with SA a further 1.5 seconds back. Renouf from the Artemis Rowing Club in Victoria led all the way to win convincingly by 12.1 seconds. This was a very even race for the first half. However Victoria moved away from the field in the second half to win by 2.4 seconds to WA.